Agga Bai! : One day, two movies and GRAVITY! One day, two movies and GRAVITY! 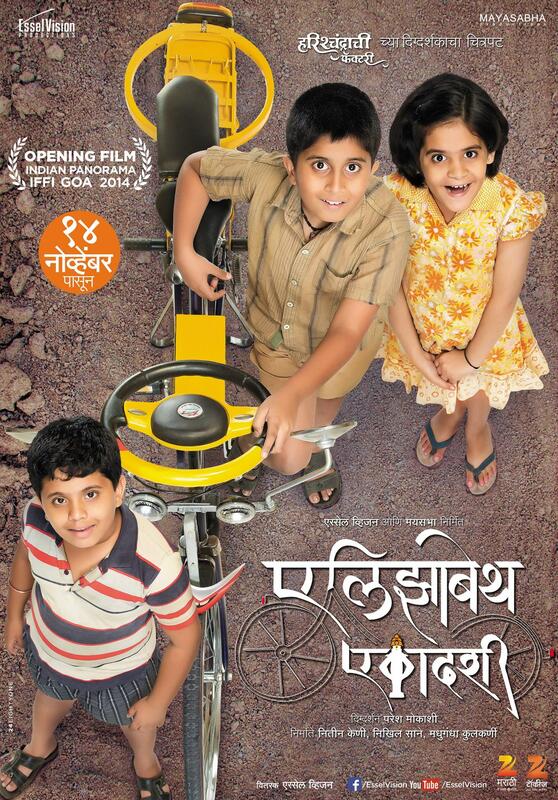 This new genre of Marathi movies- simple, yet compelling in story-telling. Low on budget, high on thought and feel. Elizabeth Ekadashi-I saw the posters... a bunch of kids looking up at us with twinkling eyes, and their bicycle with a... wait! Is is that a steering wheel?! Paresh Mokashi directing it- this had to be worth the watch. So I went for it yesterday, with Vi in tow,of course- 4:30 pm at PVR, Oberoi mall! At the ticket kiosk, I saw Interstellar for 7:00 pm. So what the heck! We bought tickets for those too! The movie started a good half hour late, with a dozen trailers, and advertisements and social messages for the audience. 'A Minute for Mumbai'- 3 social shorts... well made. Everyone around was appreciatively nodding, as an old lady, a very pregnant woman, and a blind man on the screen, checked under their seats, but NO ONE, including yours truly, looked under our seats. We are very trusting, and naive and rather laidback about certain things- us Mumbaikars. We are also very appreciative about well made social promotional messages). Then came the Women in Films and Television themed National Anthem, opened with Sonam Kapoor, followed by Shruti Hassan! WTF! But let's not digress. The music... happy, addictively rhythmic, and nostalgic to those who have heard Marathi music in the days of Door Darshan and Vividh Bharati. On-screen is the black stone idol of Vithoba, of Pandharpur, and the priests and temple staff going about their religious routine. Enter the protagonist, little Dnyana (Dnyanesh) delivering a very cheery, animated modern day sermon, about 1 God, or many Gods, and Newton, Einstein, Gravity, Relativity and such. Dnyanesh and his sister Zendu live with their mother and grandmother, managing a hand-to-mouth sustenance. The siblings and their motley bunch of friends love Elizabeth, a quirky looking bicycle with eyes, lips, and a steering wheel, that was an unfinished invention of their now dead father. The kids decorate her with little laterns pretending they are her earrings, and tease Dnyana about her being his wife (Bike! Baayko! total Marathi reference) When their mother's sweater making machine is taken away by the bank, for defaulting on payments, the family has to find some means to pay Rs.5000 in the next four days, or risk having to sell Elizabeth for Rs.2000 to raise the money. The characters are brilliant, their personalities clearly defined, yet layered. The story was building up steadily to an interesting situation. Will they? Or won't they? Mokashi gives us a true feel of the small bustling temple town, where kids still run free and almost everyone knows each other, and word of mouth is still the primary mode of communication. A temple town where activities, including prostitution depend on the annual influx of Varkaris (Mokashi's treatment of prostitution is subtle, fleeting and respectful- even in Harishchandrachi factory. I think he needs to make a movie on the topic). The scenes and background score is achingly simple and brilliant. But somewhere at the end, I felt cheated. I wanted more of Elizabeth, I wanted more of Dnyana's intellect and Kirtan skills to be central to the story. The end was simple a series of coincidences... of good luck and good will. Left too much to chance. I guess Mokashi had set a very high benchmark with Harishchandrachi Factory. While beautiful in its own right, Elizabeth Ekadashi did not live up to that expectation. And Vi- she did not like it. Maybe she was too young for it. Maybe she found the frustrated, stern yet loving mother disturbing. And then after half an hour in the play zone, we went for Interstellar. Which led to a series of questions and thoughts... by Vi and me (she loves Sci-Fi, Space, robots, astronauts). This is so so sooooooooo like Signs by M. Night Shyalaman. Why is it that the only female astronaut onboard is a biologist (carrying 'fertilised eggs!') and spouts emotional "LOVE transcends time and space" theories? Why does she nearly kill herself, although she knows she is the only one who can implement Plan B, if A doesn't work? What was so important about that data, that she chased it instead on returning to the ship? How can you receive signals, but not be able to send any messages, when the other probes had been relaying signals all the time? I need to learn Binary, Morse and Telekinesis! You can program gazillion bytes of complex quantum data into an analogue watch 30 years old, that uses god alone know what phenomenal batteries to keep ticking that long! And of all places, the '5th dimensional reconstruction' had to appear behind the bookshelf in a kid's room, instead of the Physicist's workboard, that has endless equations scrawled across. Apparently it is so much more sensible for sentient 5th dimensional beings to inspire you to knock books, than to let you scribble on the board. Writing on the wall? Whoever heard of that! Why does Cooper send the message 'STAY'? He DOESN'T want himself, going to space to come back and send that solution that saved the world? I mean, if he had listened to Murph and stayed, he would have never been there behind the bookshelves at that point giving out that important solution. This is totally contradictory! Rectangular modular robots? For all its adjustable humane programming, it looks like a slab. I am certainly not saying make humanoid forms, but *THAT* form??? It simply does not do any justice to the functions it performs. Clumsy and inefficient, to say the least. Seriously what were the product-designers thinking? WERE they even thinking to begin with? That said, I love TARS! Muahhh! Why doesn't Wes Bentley get meatier roles? He is hot, brooding and silent. I love him. But I think I love TARS more, despite him being such a SLAB. And what is Tom Cooper's second son's name? Cooper Cooper? When are they getting back to Earth? I like English movies better than Marathi movies. Great Reviews. I'm keen on catching Elizabeth Ekadashi! Mokashi has such a compelling visual and narrative style. He keeps you wanting more. That's why the end seemed too abrupt and too coincidental.